Bright lifetime Nichia LED light. Durable aluminum body stands up to falls and rough handling. Small enough to fit in your pocket. Push-button switch allows one-handed operation. Clips easily to pocket, tool bag or briefcase. Extended run time and reduced battery consumption result in cost savings. Includes two AAA batteries. 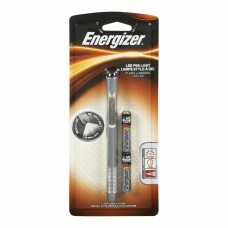 Flashlights Type: Aluminum Penlight, Global Product Type: Flashlights, Battery Type: AAA, Power Source(s): 2 AAA (incl. ).